Marie Antoinette (November 2, 1755 – October 16, 1793), the Archduchess Maria Antonia of Austria, was later titled, Marie Antoinette, Queen of France and Navarre, as the queen consort and wife of Louis XVI of France. She was the daughter of the Holy Roman Emperor Francis I and Maria Theresa of Austria. She was married to Louis XVI at age 14 in a move to seal a favorable alliance between France and Austria. She was the mother of "the lost Dauphin" (Louis XVII), named so because of rumors regarding his uncertain demise during the infamous Reign of Terror during the French Revolution. Marie Antoinette is remembered for her legendary excesses, and for her death: she was executed by guillotine in 1793 for the crime of treason. 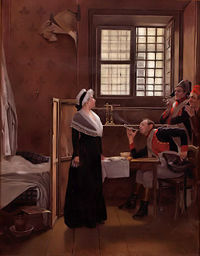 In recent years some modern historians have attempted to exculpate her image; many of her excesses were common practices among other European royalty of that era; additionally, she displayed tremendous loyalty and courage during the dark and tempestuous days of the French Revolution. Marie Antoinette (who was given the Latin baptismal name of Maria Antonia Josepha Johanna) was born at the Hofburg Palace in Vienna. She was the fifteenth child, and eleventh (and last) daughter, of Francis I and Empress Maria Theresa. Her siblings included an older sister Maria Carolina of Austria, a younger brother Maximilian, and three older brothers Joseph, Leopold and Ferdinand Karl, all of whom had already begun to exert their influence over the Hapsburg Empire. Marie Antoinette's sisters were quickly married off to the heads of European royal houses—Maria Christina to the regent of the Austrian Netherlands; Maria Amalia to the prince of Parma; and her favorite sister, Maria Carolina, to King Ferdinand of Naples. In 1748, the Treaty of Aix-la-Chapelle was signed with the intention of ending nearly a century and a half of intermittent conflict between Austria and France (the two countries subsequently became allies in the Seven Years' War, 1756–1763). In an effort to preserve this alliance, it was proposed that Louis XV of France's heir, his grandson Louis-Auguste, marry one of Empress Maria Theresa's daughters. Upon the sudden deaths of her elder sisters from smallpox (Johanna Gabriella in 1762 and Maria Josepha in 1767), Marie Antoinette was next in line. Following lengthy negotiations, the official proposal for the teenage girl was made by Louis XV in 1769. Only after the marriage treaty was signed did Maria Theresa realize her daughter lacked sufficient knowledge of the French language and customs and tutors were summoned to prepare the girl for her role as future Queen of France. In a letter to King Louis XV her mother said of the betrothal, "Her intentions are excellent, but given her age, I pray you to exercise indulgence for any careless mistake... I recommend her once again as the most tender pledge which exists so happily between our States and our Houses." On April 21, 1770, Marie Antoinette, at the age of 14, would begin the journey that would take her from her home and family permanently. She tearfully left Vienna to her mother's parting words, "Farewell, my dearest. Do so much good to the French people that they can say that I have sent them an angel." Traveling along the Danube River and accompanied by a large entourage of carriages, they passed through Munich and Freiburg before finally reaching the Rhine border between Kehl and Strasbourg weeks later. On May 7, as a symbolic act of loyalty at the "handover" held on a island in the middle of the Rhine, Marie Antoinette was required to leave her Austrian attire, possessions, servants, and even her dog behind, "that the bride might retain nothing belonging to a foreign court." She was, quite literally, stripped of her nationality before the entire Austrian delegation that was present. She was then attired in French clothing and taken to Strasbourg for a Thanksgiving Mass in her honor. The entire city was illuminated in anticipation of her arrival and the streets were strewn with flowers. A few days later, she continued her journey to Versailles. Marie Antoinette was transported by carriage to the royal palace at Versailles, where she met her future grandfather-in-law, Louis XV, and other members of the royal family. Her future husband, the Dauphin Louis-Auguste, was shy and overweight, and despite never having met, their marriage was conducted within hours of Marie Antoinette's arrival at Versailles. The Wedding Mass was lavishly celebrated in the Chapelle Royale on May 16, 1770. Just before the wedding, Marie Antoinette was presented with the magnificent jewels traditionally belonging to a French dauphine. The collection included an elaborate diamond necklace which had belonged to Anne of Austria and pieces which had also belonged to Mary Queen of Scots and Catherine de' Medici. The large collection of gems was valued at approximately two million livres. Marie Antoinette also received a personal wedding gift from King Louis, a diamond-encrusted fan. The dauphin and Marie Antoinette were married in front of the court, with the bride wearing a dress decorated by large white hoops covered in diamonds and pearls. The court then accompanied the young couple to their marriage bed, which had been blessed by the archbishop of Reims. However, the marriage was not consummated and would not be for several years. Rumors began to circulate that Louis-Auguste might be impotent because Marie Antoinette did not conceive until seven years into her marriage. Marie Antoinette's brother, Emperor Joseph II, visited her in April 1777. He had come to inquire about the state of her marriage, since the Austrians were concerned about her failure to produce a son. They went for a long walk on the grounds of Le Petit Trianon, during which Joseph criticized her for her gambling and parties. He also had a deep conversation with Louis XVI in which they discussed the couple's sexual problems. Whatever Joseph II said to Louis XVI, and whatever the cause of the couples' infertility, the conversation obviously helped, for the marriage was soon consummated. The couple's first child was born on December 19, 1778. In addition to rumors, the young dauphine, new to the ways of the court, also faced problems of jealousy; particularly from the King's mistress, Madame du Barry. Born Jeanne Bécu, she was a commoner who gained the notice of nobility as a courtesan. Since Marie Antoinette felt it was beneath herself to associate with such a woman, du Barry set out to make her life as unpleasant as possible. Her mother and others from the Austrian court told her that to snub the king's favorite was "most unwise in her current position," meaning that a wife in an unconsummated marriage was in a vulnerable position. Due to royal protocol, Madame du Barry was not allowed to speak with Marie Antoinette until spoken to first. It is reported that Marie said to her at a ball, "There are a lot of people at Versailles tonight, aren't there," and walked away to mingle with others. After the incident, Marie Antoinette, who corresponded often with her mother, said, "My duties here are sometimes hard to fulfill." Daily life for Marie Antoinette could be tedious and routine. For example, she was assisted out of bed each morning and dressed by her various ladies-in-waiting. There was elaborate royal etiquette involved. For example, the lady-in-waiting with the highest rank present was the only one allowed to handle her bloomers. Only a certain lady could tie her petticoats, but a different one had to put them on her. After about a month she finally convinced her ladies-in-waiting to allow her to bathe herself. 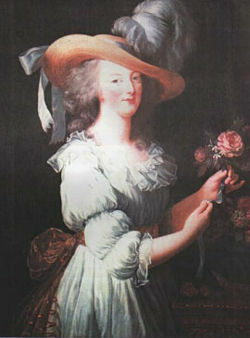 Marie Antoinette, missing the companionship she had enjoyed with her sister Maria Carolina, found a substitute in Princess Thérèse de Lamballe. 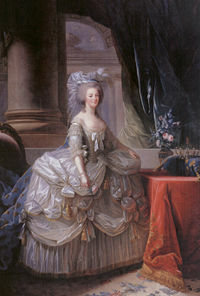 The Princess de Lamballe was wealthy and kind-natured, and devoted to Marie Antoinette. Marie Antoinette also formed a deep friendship with the beautiful aristocrat Gabrielle, Comtesse de Polignac. Additionally, she was on favorable terms with her husband's youngest brother Charles, the Comte d'Artois. Louis-Auguste and Marie Antoinette's life changed suddenly on the afternoon of May 10, 1774, when King Louis XV died of smallpox. Courtiers rushed to swear allegiance to their new king, Louis XVI, and queen consort, Marie Antoinette, then 19. In a display that impressed all those who witnessed it the new king and queen of France then fell to their knees in prayer, with Louis saying, "Dear God, guide and protect us. We are too young to reign." Louis XVI's coronation took place at Reims during the height of a bread shortage in Paris. This is the context in which Marie Antoinette is said to have joked, "If they have no bread, then let them eat cake!" ("S'ils n'ont plus de pain, qu'ils mangent de la brioche"). However, there is no evidence that this phrase was ever spoken by Marie Antoinette. When Marie Antoinette actually heard about the bread shortage she wrote, "It is quite certain that in seeing the people who treat us so well despite their own misfortune, we are more obliged than ever to work hard for their happiness. The king seems to understand this truth; as for myself, I know that in my whole life (even if I live for a hundred years) I shall never forget the day of the coronation." The young royals were greeted with an outpouring of national joy, and the queen was especially adored, despite the cost of the coronation. Almost seven thousand livres were spent on a new crown for Louis XVI, and Marie Antoinette's magnificent gown was ordered from the fashion house of Paris' most exclusive designer, Rose Bertin. Shortly after the coronation, Marie Antoinette attempted to bring Étienne François, duc de Choiseul back to the court. He had been banished by Madame du Barry because of his loyalty to Marie Antoinette and the alliance with Austria. The new queen did not have much success. Although King Louis did meet with Choiseul, he did not bring him back to court permanently. Later, when she tried to have her friend, the duc de Guines, appointed ambassador to England, Louis XVI said, "I have made it quite clear to the queen that he cannot serve in England or in any other Embassy." It was obvious from the outset that Marie Antoinette enjoyed little political influence with her husband. Under the influence of d'Artois, Marie Antoinette began visiting the Paris Opéra balls in disguise. Although she had a lifelong love of music and singing, gossip began circulating that the queen was orchestrating the outings in order to meet with various secret lovers. Oblivious to the national debt, the queen overspent on clothes, gambling and diamonds. For her twenty-first birthday, she participated in a three-day long gambling party, in which huge amounts of money changed hands. Her spending habits caused quite a stir as France was on the verge of bankruptcy. The long series of wars fought by Louis XIV and Louis XV had left France with Europe's highest national debt. French society was under-taxed and what little money was collected failed to save the economy. Louis XVI was persuaded by Pierre Augustin Caron de Beaumarchais to support the American revolutionaries in their fight for independence from Britain. This decision was a disaster for France, despite its victory, because the cost was enormous. 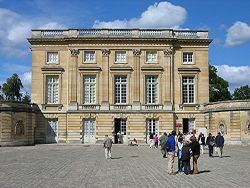 She was also criticized when she began to spend more time at Le Petit Trianon, a small château on the palace grounds. 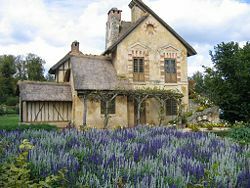 The château was renovated for her and the costs soon spiraled out of control, especially when the gardens were redesigned to suit the queen's new tastes. Although she was fiercely criticized for this venture, building small mock villages was a popular past-time of aristocracy who sought calmer retreats within their large estates. Marie Antoinette's first child was born at Versailles on December 19, 1778. She was forced to endure the humiliation of a public birth in front of hundreds of courtiers in her bedchamber. The queen fainted from a combination of embarrassment and pain. It was the last time such a ritual was permitted; Marie Antoinette refused to give birth in public again. The baby was a girl, and she was christened Marie-Thérèse-Charlotte. In accordance with court etiquette, the baby was soon referred to as Madame Royale, a title always given to the eldest daughter of the French king. Despite the fact that the country had desired a boy—an heir to the throne—Marie Antoinette was delighted with a girl. "A son would have been the property of the state," she said, "You shall be mine; you shall have my undivided care; you will share all my happiness and you will alleviate my sufferings..." Madame Royale was followed by three other children—Louis-Joseph, Dauphin born in 1781, Louis-Charles, Duke of Normandy in 1785 and Sophie-Béatrix in 1786. Marie Antoinette grew less extravagant as she embraced motherhood. She was devoted to her children and was very involved in their care. On the birth of her son, the next in line to the throne, she described the moment as "the happiest and most important event for me." Her husband proudly said, "Madame you have fulfilled our wishes and those of France, you are the mother of a Dauphin." After she turned thirty, in 1785, Marie Antoinette began to dress with more restraint, as well. She abandoned the more elaborate wigs which had been festooned with jewels and feathers, and she refused to buy any more jewels for her personal collection. Later pictures show her in unadorned gauze dresses and bonnet type hats that denote more the look of shepherdess; in fact she was criticized for simplicity unbefitting a queen. 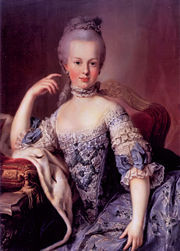 Marie Antoinette was involved in an incident in the 1780s that has since been referred to as "The Affair of the Diamond Necklace.” She was implicated in a crime by contemporary public opinion and "The Affair" was historically significant as one of the events that led to the French populace's disillusionment with the monarchy that eventually culminated in the French Revolution. The incident began with Marie Antoinette refusing to buy a magnificent diamond necklace from the Royal Jewelers (she said the cost was too high and that the royal family preferred now to spend their money on the navy). In an elaborate scheme, the Comtesse de la Motte, an impoverished aristocrat, pretended to be an intimate friend of the queen's, while simultaneously persuading Louis, Cardinal de Rohan that the queen secretly desired the necklace. The cardinal paid the two million livres to her (as middleman) and the Comtesse collected the necklace from the jewelers (who were under the impression that she was acting on behalf of the queen and that payment would be forthcoming). The Comtesse proceeded to disappear with both the jewels and the money. When the time came to pay, the jewelers complained to the queen, who told them that she had received no necklace and had never ordered it. She had the story of the negotiations repeated for her. On August 15, 1785, Assumption Day, when the whole court was awaiting the king and queen in order to go to the chapel, the Cardinal de Rohan was arrested as an accomplice in the scandal; the Comtesse de la Motte was found and subsequently arrested three days later, on August 18, 1785. The police set to work to find all accomplices and a sensational trial commenced with Cardinal de Rohan accepting the parlement of Paris as judges. On May 31, 1786, the trial resulted in the acquittal of the Cardinal, among others, while the Comtesse was condemned to be whipped, branded and banished to the prostitutes' prison. Most historians have come to the conclusion that Marie Antoinette was blameless in the matter, that Rohan was an innocent dupe, and that the Comtesse de la Motte deceived both for her own gain. At the time, however, the scandal further damaged Marie Antoinette's reputation and according to some historians it became a precipitating event of the French Revolution. In addition to the political disaster of the “Diamond Necklace Affair,” the royal family also suffered several terrible personal tragedies. In 1787, Marie Antoinette's youngest daughter, Sophie-Béatrix, died shortly before her first birthday. The queen was devastated and spent hours weeping over the baby's body. Not long after, the royal physicians informed her that her eldest son, the Dauphin Louis-Joseph, was terminally ill with consumption. The child's condition deteriorated and Marie Antoinette spent most of her time nursing him during his final months. Political events then began to unfold that also had dire consequences for their family. Because the French government was seriously in debt, due to inefficient taxation and costly foreign wars, the king summoned a Council of Nobles to discuss the situation. The Assembly of Notables, as it was called, could find no solution to the government's financial crisis. Louis XVI was left with no alternative other than to call a meeting of the Estates-General in May 1789. The Estates-General was the main representative body of the French population, but it had not been called since the reign of Louis XIII in 1614. Within days of the meeting, the Estates-General was clamoring for reforms and criticizing the monarchy and its policies. However, the royal family was preoccupied with other problems. On June 4, the dauphin died at age seven. The king sank into sporadic bouts of depression, and the queen was heartbroken. The ultra-royalist circles at Versailles feared and resented the Estates-General. Marie Antoinette was coming to suspect that the reformists in the Estates-General were secretly working to overthrow the monarchy. On July 11, Marie Antoinette and her brother-in-law, the Comte d'Artois, persuaded Louis XVI to dismiss the liberal prime minister, Jacques Necker. Marie Antoinette's ally, the Baron de Breteuil, was made prime minister instead. Breteuil was a devout Roman Catholic and a committed royalist. The monarchy's enemies painted him as a ruthless tyrant, and Paris was gripped by fear that the royalists were planning a military attack on the city in order to force it into submission. Consequently, a large mob marched on the symbol of royal authority in Paris, the Bastille Prison, and seized control of it on July 14, 1789. The governor of the prison was lynched. News did not reach the palace until very late that evening. When Louis XVI heard it, he asked, "This is a revolt?" to which the duc de la Rochefoucauld-Liancourt replied, "No, sire. It is a revolution!" Panic ensued and many courtiers fled for their lives. The Comte d'Artois fled abroad, fearing he would be assassinated. Marie Antoinette's friend Duchesse de Polignac, the governess of her children, fled to Switzerland, where she corresponded with the queen. 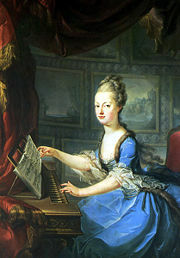 Marie Antoinette appointed the devout and disciplined Marquise de Tourzel as governess to the two surviving royal children—Princess Marie-Thérèse and the new dauphin, Louis-Charles. Marie Antoinette also hoped to flee; feeling it was unwise to remain so close to Paris during the current troubles. She hoped that the king would give orders for them to move to their château at Saint-Cloud. However, Louis, in what would surely be a regrettable decision, insisted that they stay at Versailles. On October 5, 1789, rumors spread in Paris that the royals were hoarding all the grain. A hungry and angry mob of peasants decided to march on Versailles. Fortunately, one of the king's courtiers, the young Duc de Fronsac, was in the city at the time and ran on foot through the woods to the palace to warn Marie Antoinette of the angry mob's furor. An emergency meeting was held to determine what the royal strategy should be with Marie Antoinette once again repeating her plea that the king and his family flee. The king refused insisting that it was his duty to stay. Aware that she was the primary target of the mob's anger, Marie Antoinette chose to sleep alone that evening. She left strict instructions with the Marquise de Tourzel that she was to take the children straight to the king if there were any disturbances. In the early hours of the morning the mob broke into the palace. The queen's guards were massacred. She and her two ladies-in-waiting only narrowly escaped with their lives before the crowd burst in and ransacked her chambers. Taking the Duc de Fronsac's advice, the three ladies ran to the king's bedchamber. The king's younger sister, Madame Élisabeth, was already there, and when the children arrived the doors were locked. A large crowd gathered in the palace's courtyard and demanded that the queen come to the balcony. She appeared in her night-robe, accompanied by her two children. The queen then stood alone for almost ten minutes, whilst many in the crowd pointed muskets at her. She then bowed her head and returned inside. Some in the mob were so impressed by her bravery that they cried "Vive la Reine!" The royals were forced to return with the mob to Paris. They were taken to the dilapidated Tuileries Palace, which had last been used during the reign of Louis XIV. The Marquis de la Fayette, a liberal aristocrat who had embraced many American ideas when he fought for George Washington, was placed in charge of the royal family's security. When he met the queen, he bluntly told her, "Your Majesty is a prisoner. Yes, it's true. Since Her Majesty no longer has her Guard of Honour, she is a prisoner." Other royal "prisoners" included Louis XVI's sister, Élisabeth, and his other brother, the Comte de Provence. Desperate to reassure her friends, Marie Antoinette sent a short note to the Austrian ambassador saying, "I'm fine, don't worry." Although the Royal family kept up some pretense of their usual activities, they were watched closely, and the monarchy would continually be under siege in one form or another from then on. From the beginning of the revolution, Marie Antoinette and Louis had hopes for a compromise: in other words, a constitution that would include the monarchy. Trying to re-establish normalcy, Marie Antoinette continued her generous patronage of the poor children of Paris. She also spent as much time as possible with her own children, particularly the dauphin. Public hatred of the queen, however, grew so intense that she had to attend her daughter's first Communion incognito. The traditional gift for a princess upon her first Communion was a set of diamonds, but both Louis XVI and Marie Antoinette decided it would be better that Marie Thérèse forgo such a gift. Meanwhile, the National Constituent Assembly was drawing up a new constitution which would turn France into a constitutional monarchy. Marie Antoinette held secret communications with the Comte de Mirabeau, a prominent member of the National Constituent Assembly who hoped to restore the authority of the crown. Catherine the Great wrote to Marie Antoinette from Russia, telling her that the royals should ignore the complaints of their people "as the moon goes on its course without being stopped by the cries of dogs." Louis's sister, Élisabeth, was even more vocal in her hatred of the new system. Élisabeth, like her exiled brother the Comte d'Artois, was so horrified with the turn of events that she believed a civil war was inevitable; in fact there were those who sought precisely that outcome as a means of resolution to the crisis. On July 14, 1790, the royal family was required to attend festivities to celebrate the first anniversary of the fall of the Bastille. The queen dutifully attended, even though she described the celebrations as symbolizing "everything that is most cruel and sorrowful." Like other émigrés with divided loyalties, the king's liberal cousin, Philippe duc d'Orléans, returned from England and publicly proclaimed his support for the revolutionaries. The duke enjoyed enormous popular support amongst the people of Paris, although his Scottish mistress Grace Elliott was a secret royalist. Hope of compromise between the royals and the revolutionaries dimmed with the creation of the Civil Constitution of the Clergy in 1790. This was a republican attack on the privileges and ancient practices of the Roman Catholic Church. By 1791 both the king and the queen had come to the conclusion that the Revolution was going to destroy France. They came to the decision to flee to Montmédy, a royalist stronghold in the east of France. There they would gather their supporters and any foreign assistance they could (Marie Antoinette's brother Emperor Leopold II, Catherine II of Russia, the king of Sweden and the king of Prussia had all promised military aid). They hoped that once they had escaped they would be able to negotiate with the revolutionaries. The royals' escape was foiled at the town of Varennes, when the king was momentarily recognized, and they were forced back to Paris by local republicans. They were returned to the Tuileries Palace. However, by then it had become clear to the people of France that the king and the entire royal family were "enemies" of the revolution. Marie Antoinette then tried to preserve the crown's rapidly deteriorating position by secretly negotiating with Antoine Barnave, leader of the constitutional monarchist faction in the assembly. Barnave persuaded Louis to openly accept the new constitution in September 1791, but the queen undermined Barnave by privately urging her brother, Leopold II, Holy Roman Emperor, to conduct a counterrevolutionary crusade against France. Louis's attempt to regain his authority by declaring war on Austria in hopes that a quick defeat of France would cause the Austrians to restore the monarchy backfired. When the duke of Brunswick, commander of the Austro-Prussian army invading France, issued a manifesto threatening Paris with destruction if the royal family were harmed, reaction in Paris was swift and brutal. Rather than heeding the manifesto, the revolutionaries were enraged by it, and they attacked the Tuileries on August 10, 1792. Marie Antoinette's initial decision was to stand and face the mob, even if it meant doing so on her own. However, her ladies-in-waiting begged her to think of her children and she reluctantly agreed to accompany the king and his entourage when they fled the palace for the National Assembly. The palace was invaded in their absence, and the Swiss Guard were massacred. The governor of the Tuileries, the Marquis de Champcenetz, managed to escape to Paris with the help of Grace Elliott. Louis XVI was arrested by the republicans on August 13, and just over a month later, on September 21 the National Convention abolished the monarchy. The royal family was then moved to the Temple Fortress and imprisoned. The king, queen, their two children and Louis's sister Elisabeth were heavily guarded, in case of an attempted rescue by royalists. After the imprisonment of the royal family, Paris erupted into violence. The mob invaded the prisons and massacred anyone suspected of royalist leanings. Marie Antoinette's dearest friend, the Princesse de Lamballe, was captured and told to repudiate her oath of loyalty to the queen. When she refused, she was murdered and her head placed on a pike. Eyewitness accounts of this event were given by the Comte de Beaujolais and wax-modeler Marie Tussaud, who was forced to make the death-mask of the princess. The head was taken to Marie Antoinette's window and displayed outside it. According to her daughter, the queen was “frozen with horror,” and she then collapsed to the ground in a dead faint. Louis was tried for treason on December 11, and was subsequently condemned to death on January 17. He was allowed one last farewell supper with his family, at which he urged his young son not to seek vengeance for his death. The queen spent the next few hours huddled against her husband, clutching their son. Marie Thérèse sobbed hysterically, whilst Elisabeth clung to her brother. Louis was taken to the guillotine the next day. Marie Antoinette never fully recovered from her husband's death. According to her daughter, "She no longer had any hope left in her heart or distinguished between life and death." On the night of July 3, 1793, commissioners arrived in the royal family's cell with instructions to separate Marie Antoinette's son from the rest of his family. Exiled royalists proclaimed the dauphin King Louis XVII upon the death of his father. As a result the republican government decided to imprison the eight-year-old child in solitary confinement. Louis flung himself into his mother's arms crying hysterically, and Marie Antoinette shielded him with her body, refusing to give him up. When the commissioners threatened to kill her if she did not hand the child over, she still refused to move. It was only when they threatened to kill Marie Thérèse that she came to realize how hopeless the situation was. Two hours after the commissioners had entered her room, the former queen relinquished her son to them. They did not meet again; her son died in captivity in 1795. At 2 A.M. on August 2, 1793, Marie Antoinette was awakened by guards and told to get dressed. She was then taken from her daughter and sister-in-law and transferred across Paris to the Conciergerie Prison. She was given the pejorative title, "the Widow Capet," taken from the Capetian Dynasty whose founder was Hugh Capet. She was no longer to be referred to as "Marie Antoinette" but simply "Antoinette Capet" or "Prisoner No. 280." On August 29, 1793, she was visited by Alexandre Gonsse de Rougeville, a devoted supporter who passed a secret message hidden in the petals of a carnation. The message informed the queen to prepare herself for imminent rescue. The plan failed when guards intercepted Marie Antoinette's reply, which she had pin-pricked into a piece of paper. The "affair of the carnation" fueled speculation of a widespread royalist conspiracy, and the queen was consequently placed under even tighter security. 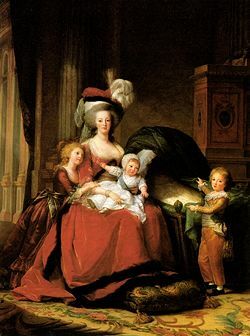 There were some outside of France who wished to help Marie Antoinette escape on her own but she responded in writing, "I could not have any pleasure in the world if I abandoned my children. I do not even have any regrets." She was brought to trial on October 14. When she entered the courtroom, most people were shocked at her appearance as she looked emaciated, prematurely aged, and exhausted. Forty witnesses were called by the prosecution but after 16 hours of interrogation she had managed to not implicate herself or any of those who had plotted to free her. She was condemned to death for treason on October 15. She wrote her final letter known as her "Testament," to her sister-in-law Elisabeth in which she expressed her love for her friends and family and begged that her children would not seek to avenge her murder. 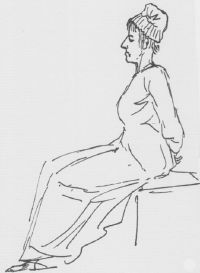 On the morning of October 16, 1793, a guard arrived to cut her hair and bind her hands behind her back. She was forced into a tumbrel and paraded through the streets of Paris for over an hour before reaching the Place de la Révolution where the guillotine stood. She stepped down from the cart and stared up at the guillotine. The priest who had accompanied her whispered, "This is the moment, Madame, to arm yourself with courage." Marie Antoinette turned to look at him and smiled, "Courage? The moment when my troubles are going to end is not the moment when my courage is going to fail me." At 12:15, Marie Antoinette was executed. The bodies of Marie, Louis XVI and Madame Elisabeth (Louis' sister) were buried in a mass grave near the location of today's La Madeleine church. Following the restoration of the Bourbons, a search was conducted for the bodies. On January 21, 1815, more than twenty years after her death, her corpse was exhumed—a lady's garter helped with identification—and Marie Antoinette was buried at the side of her spouse in the crypt of the Basilica of St Denis just outside of Paris, the traditional final resting place of French monarchs. King Louis XVIII raised this monument to consecrate the place where the mortal remains of King Louis XVI and Queen Marie-Antoinette, transferred on 21 January 1815 to the royal tomb of Saint-Denis, reposed for 21 years. It was finished during the second year of the reign of Charles X, year of grace 1826. Traditional histories have portrayed Marie Antoinette as a shallow, weak, and self-indulgent person. The trend in recent years, however, has been to focus on Marie Antoinette's strengths rather than her weaknesses. In 1933, Stefan Zweig wrote a biography, Marie Antoinette: The Portrait of an Ordinary Woman, in which he argued that the queen achieved greatness during the final years of her life thanks to her extraordinary courage. His biography was later made into a hugely successful movie starring Norma Shearer. French historians, such as André Castelot and Évelyne Lever, have generally been more critical in their biographies of Marie Antoinette, although neither has attacked her with the venom she received during her lifetime. The most thorough biography of Marie Antoinette has been written by British historian Lady Antonia Fraser. Marie Antoinette: The Journey was first published in 2001 and became a bestseller. The book was later adapted into the Hollywood movie directed by Sofia Coppola in 2006. Marie Antoinette's life provided inspiration for the novel Trianon (first published in 1997) by author and historian, Elena Maria Vidal. Based on Vidal's painstaking research, this novel depicts pre-revolution life at Versailles. Trianon is the prequel to Madame Royale which is inspired by the life of Princess Marie-Thérèse-Charlotte, daughter of Marie Antoinette and Louis XVI. Marie Antoinette was a leading fashion icon and trendsetter of her time. The cover story of the September 2006 issue of Vogue magazine was about the Sofia Coppola movie, with an accompanying feature article about Marie Antoinette's contributions to fashion styles of the era. Marie Antoinette popularized the pouf, an aristocratic hairstyle where the hair was teased as high as possible, coated with powder, elaborately curled, and then adorned with various ornaments and feathers. Created by fashion designer Rose Bertin, a pouf typically had a theme or message conveyed in its details: a pouf for attending a funeral, for example, would be adorned with black decorations and a veil. 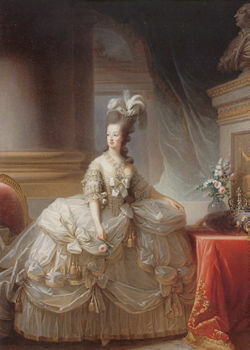 The pouf became Marie Antoinette's signature style, and the trend spread rapidly among the French nobility of the time. ↑ 1.0 1.1 Antonia Fraser, Marie Antoinette (New York: Anchor Books, 2006, ISBN 0307277747), 37-38. ↑ Chapelle Expiatoire, Paris. Retrieved August 23, 2013. This page was last modified on 14 August 2018, at 19:29.